When Dr. Richard Gardner, a psychiatrist, first coined the term “parental alienation” – it was met with confusion, disbelief, and questions. Even today, many people believe that a child cannot be turned against a parent. Though parents certainly hold a much higher place in the child’s mind, it only takes some though back to our own early childhood development to remember how easily the minds of children can be influenced to turn against another. It happens on playgrounds everywhere. Parental Alienation Syndrome, a hotly debated “condition”, was brought to the public consciousness by Dr. Douglas Darnell. Currently, there is a move afoot to have the condition added to the latest iteration of the DSM (V). While professionals and laypersons alike will debate whether or not the impacts of parental alienation on children rise to the level of a diagnosable, mental health medical condition will not likely end regardless of the decisions of the psychiatric community. One thing is clear – the effects of parental alienation on both children and parents is quite damaging. When the attachment between a targeted parent and a child has been broken through the systematic efforts of a high-conflict parent (or other guardian), you have parental alienation. The child is effectively manipulated into breaking off their relationship with the targeted parent. The child doesn’t have a justifiable reason for this occurrence. It is behavior that is taught, that is coached by the parent. Communication Interference. When phone calls, emails, and other forms of your communication attempts are regularly intercepted or blocked, the distance between you and the children grows. This is a characteristic of parental alienation efforts. False Allegations of Abuse. So often used in highly contentious child custody matters, a child can be made to “remember” situations and events that never actually occurred. A systematic effort can quickly damage a child’s view of the targeted parent, making them fearful of having any contact at all. This is a characteristic of parental alienation efforts. Positive Parent-Child Relationship Turns Negative. When your once positive relationship with the children suddenly turns sour, there is reason to suspect parental alienation efforts are at work. Children Are Constantly Unavailable. When the alienating parent has over-scheduled the children for extra-curricular activities or otherwise engages in custodial interference – this is a characteristic of parental alienation efforts. Intense Fear by Children of Targeted Parent. Regardless of the circumstances, when the children suddenly develop an intense fear of the targeted parent where none previously existed – there again is reason to suspect that parental alienation is being done. Parental alienation is so very prevalent in high-conflict child custody matters. When a malicious parent chooses to place the children in the middle of disagreements between the parents, a child can be forced into a situation where they feel compelled to choose between the parents – a horrible situation for them. Very often, it’s a defense mechanism for the kids. It is a form of self-protection, particularly when they spend a larger amount of time with the alienating parent. In order to placate that parent, the child is easily swayed to hate the targeted parent and can quickly gravitate away from any form of a relationship with them. It is ultimately of paramount importance that the targeted parent not give up hope of overcoming parental alienation efforts. Always continue to attempt to make contact with your children. Document your efforts meticulously. Save rejected gifts, letters, and cards. Copy yourself on emails sent. Always broadcast the message, “I LOVE YOU” to your children. Defend yourself against false allegations with via journaling or through the use of available, quality, court-recognized child custody software programs like the one we’ve recently recommended: Our Family Wizard. 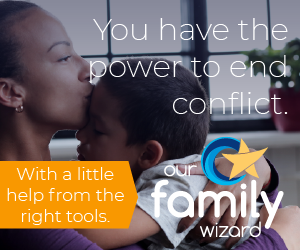 The Our Family Wizard program becomes a repository of information regarding all facets of your situation, from communication efforts to custodial periods, custody exchanges, activities, and other areas of concern. It helps to avoid undocumented communications such as phone calls and face-to-face discussions that ultimately will devolve into a situation where it is your word against theirs. Even if your ex-partner refuses to use the program (which can be used jointly and even allow third-party access for involved attorneys and other important persons working on your child custody matter) – it still enables you to clearly and concisely document all of the important matters related to your case than can come in handy in future court matters. Thank you for your post. Parental alienation is real and affecting countless children, parents and extended family members every year. By raising the visibility of parental alienation and educating legal and mental health professionals about the difference between real alienation and false allegations of abuse, and vice versa, will can help protect families from the heartbreak of this destructive family dynamic.